Founded in 1975, AMERICAN SYSTEMS provides consulting, system engineering, test and evaluation, operational training, business process outsourcing, program management support, analytical support, technical and managed services, and IT solutions nationwide to government and commercial customers. To further strengthen its engineering expertise and capabilities, BMT Syntek Technologies (BMT) has opened a Philadelphia office at The Navy Yard. For the past 20 years, BMT has equipped R&D decision makers with focused, powerful insights on programs and technology. From a commitment to encourage green building construction and innovative management practices, to our focus on the Smart Energy Campus and building a national center for energy research, education, and commercialization, The Navy Yard is at the leading edge of sustainability, and brings Philadelphia closer to Mayor Michael Nutter’s goal of becoming America’s greenest city. With active initiatives in all aspects of planning, development, operations, and business development, PIDC puts sustainable business practices to work every day. 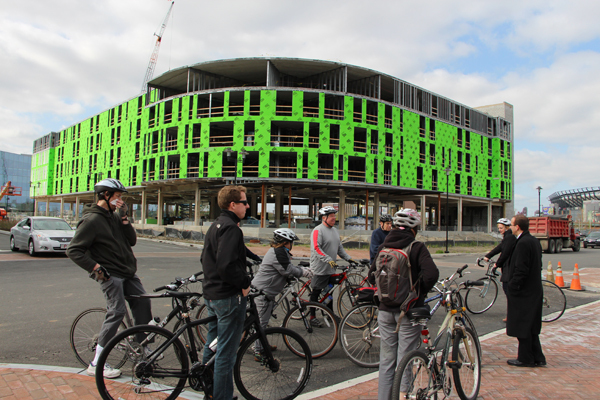 To celebrate Earth Day, PIDC hosted the 2nd annual Earth Day Bike Tour of The Navy Yard, a public, free tour where cyclists embarked on a seven-stop sustainability initiatives tour of the campus.